The AND function returns TRUE if all its arguments evaluate to TRUE, and returns FALSE if one or more arguments evaluate to FALSE. One common use for the AND function is to expand the usefulness of other functions that perform logical tests. For example, the IF function performs a logical test and then returns one value if the test evaluates to TRUE and another value if the test evaluates to FALSE. By using the AND function as the logical_test argument of the IF function, you can test many different conditions instead of just one. If the specified range contains no logical values, the AND function returns the #VALUE! error. Here are some general examples of using AND by itself, and in conjunction with the IF function. Displays TRUE if A2 is greater than 1 AND less than 100, otherwise it displays FALSE. Displays the value in cell A2 if it’s less than A3 AND less than 100, otherwise it displays the message "The value is out of range". Displays the value in cell A3 if it is greater than 1 AND less than 100, otherwise it displays a message. You can substitute any message of your choice. Here is a fairly common scenario where we need to calculate if sales people qualify for a bonus using IF and AND. 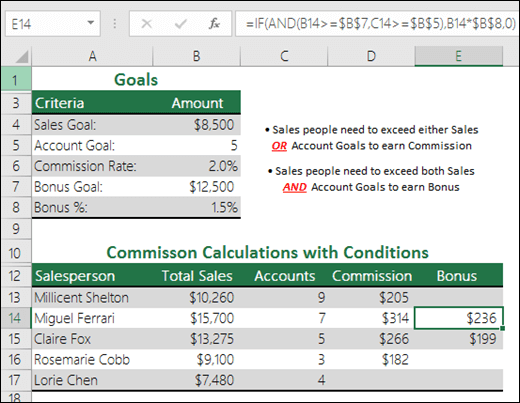 =IF(AND(B14>=$B$7,C14>=$B$5),B14*$B$8,0) – IF Total Sales are greater than or equal (>=) to the Sales Goal, AND Accounts are greater than or equal to (>=) the Account Goal, then multiply Total Sales by the Bonus %, otherwise return 0.